Fresh Headies/Bubble Bags is proud to partner with Pure Pressure to offer their Freeze Dryers to our clients. We're here to help our clients by managing the sale, arranging details, shipping. We can process Canadian customers' orders in CAD$ . Machines will be drop shipped from their warehouse in Denver, CO. Shipping to anywhere in Canada will be calculated upon receiving your order & added to the order total. For USA clients, shipping is FREE! The Medium Pharmaceutical Freeze Dryer is Perfect for Users Seeking More Capacity and Control Than the Standard Models. Nearly double the capacity of the standard medium freeze dryer! Vacuum pump + shipping and handling included in the price to the lower 48 states. The freeze dryer has built in intelligence. 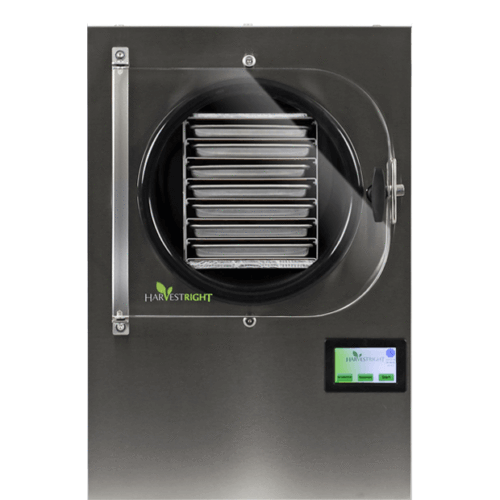 It automatically manages the freeze drying process and offers more control than the standard series. 6.75 sqft of tray space, 7 total trays.